A loyal soldier betrayed. A kingdom full of enemies. Can he clear his name and unchain his magic before the Empire cuts him down? Marrinek lost everything in an instant. Framed for a crime he didn't commit, the faithful courtier spent two years in prison before a sudden, near-lethal escape. Hunted by his own former allies, the double-crossed magic user journeys to reunite with his wife and get revenge on those who deceived him. Hiding amongst devious criminals in a seedy underworld, Marrinek unveils a kingdom-wide conspiracy that goes far beyond his own imprisonment. To save all he holds dear and against impossible odds, the soldier must lift the haze from his magic and expose the plot before his enemies strike a fatal blow. 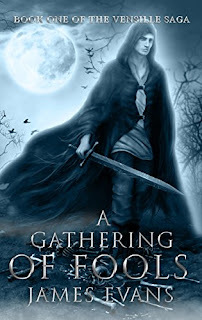 A Gathering of Fools is the first book in the Vensille Saga epic fantasy series. If you like magic and mayhem, dark violence, and heroic redemption, then you'll love James Evans’ immersive world. The book follows Marrinek who, after spending almost 2 years locked away for crimes he did not commit, finds himself in a fortunate position to escape. The story then follows as Marrinek attempts to stay free and keep away from his captors. I haven't read any of the author's other work but the start of the book felt a little disjointed, there were some sentences or words that just didn't read right, and one of my pet peeves is when authors make words more fancier than they should be, but as the novel progressed I'm glad to say that it flowed much better. The POV changed throughout the book and whilst the main protagonist and his wife were written well, I had little interest in the other characters, I just felt that their segments could have been made more interesting or removed. There is a magic system in the book with Marrinek being a very talented wielder, and whilst the author explains the system, I honestly can't describe it to you as I'm still not entirely sure how it worked. After reading this brief review, you're probably thinking I didn't enjoy the book, but I can't say for certain what my thoughts are. Maybe the biggest indicator yet is that I bought the sequel soon after finishing it, which is mainly down to the well written and exciting ending. I would also like to add that the book cover is one of the better illustrations that I've seen in a long time.